Concordia had bested the Raven in all three prior matchups and Sunday’s game was no different. The home team took the game away early in the first period, completely dominating the first frame. 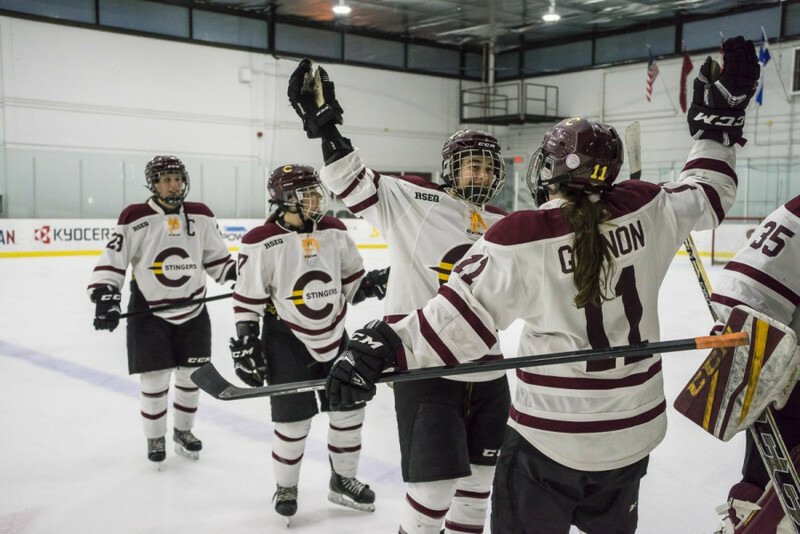 Their relentless pressure paid off quickly as Lidia Fillion scored when she batted the puck right out of mid air. Ravens’ goaltender Alexandra Lehmann had just made a brilliant save on Sophie Gagnon’s quick breakaway, but could not prevent Fillion from opening the score. Gagnon missed on that breakaway opportunity, but it was only a matter of time before the fourth-year forward would capitalize. Midway through the first, the Stingers went on the power play. Parked in front on of the net, Gagnon skillfully deflected Claudia Dubois’ bomb of a shot off of a one-timer. This goal lit a spark in what had been a burnt out Carleton squad. Up to this point the visitors had not been able to record a single shot on net. The Ravens got their first shot at 18:28 when a pass to the slot from Killip bounced off several skates before finding its way behind Katherine Purchase. Purchase saw little action in the first as her team put up 20 shots on their opponent, spending the majority of the period in Carleton’s zone. Coach Chu’s squad came out just as hungry in the second. Once again, their exhausting pace of play forced the Ravens to commit another infraction. Back on the power play, the Stingers showed cohesion with their puck possession, setting up rookie standout Rosalie Bégin-Cyr. She collected her sixth of the season with the help of Audrey Belzile and Claudia Fortin. Concordia’s total control over the game carried into the third with Melinda Prévost padding the lead a few minutes into the period. The Stingers showed some signs of slowing down towards the end of the game and it cost them when the Ravens added a second goal, Carleton’s Katia Boulianne sealing the final score. Chu praised her team’s performance and said that she was overall satisfied with the effort during the game. The Stingers will get a chance to sweep their season series this Friday, travelling to Carleton to face the Ravens on their home ice.